The crew of five on board were removed by fire crews and taken to hospital to be treated for minor injuries. 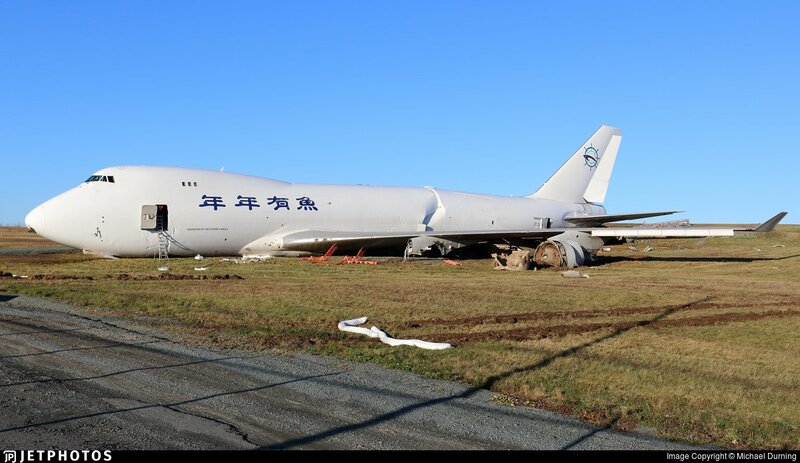 Airport spokesperson Theresa Rath Spicer said the Sky Lease Cargo plane was making a scheduled landing to pick up product and then fly to China. The plane came to a stop less than 50 metres from a fence separating the airfield from Old Guysborough Road, a public two-lane road. Rath Spicer said the accident happened at the end of Runway 32. The airfield was temporarily closed while a perimeter around the site was established, and then the main runway was allowed to reopen on a limited basis. The airport's website was reporting delays and cancellations for both arriving and departing flights Wednesday morning. "We've had a number of flights either arrive or depart, however the flight schedules continue to be significantly impacted," Rath Spicer said in an interview. "We're asking passengers to check with their airline as to their flight's status … At this point our operation is significantly impacted." Rath Spicer said Runway 32 will remain closed "for some time" as the investigation into what happened is conducted. Airport officials are continuing to provide updates on Twitter. Landed with a significant tail wind on 2300M odd runway. Atc transcript. The human aptitude for ineptitude makes any human accomplishment a miracle. That aircraft was parked next to us in Chicago two days ago. Sad to see a 747 go like that. Small company, this will hurt them. When a 3200m runway with a headwind component is available. ATC clearly advised of tailwind and asked if it was still acceptable. Sounds like crew didn’t quite understand that transmission from ATC. Wonder how long they had been on duty? Sad for there careers and another 747 gone. The 0900z metar reports cloud Bkn 005, wind is very gusty, but cross. Ils 23 is reported u/s. The incident happened at 0906z. That’s getting fairly close to preferred ils minima. Having flown a good few 744 freighters, many of them do not meet the requirements to fly rnp approaches, this one may well have, however, the only plate I can find(it is outdated) is an rnav(gnss) which has an lnav/vnav minima of 764ft, not sure hat other non precision approached are available. The weather improved on the following metal to sct005, that was at 0912z, however, things change quickly in weather like that. Glad nobody was hurt, potty about the aerie, they are a dying breed as it is. Wow I find it difficult to believe they didn't understand the wind story, even if they were tired. ATC made it pretty clear more than once. And if they didn't understand then they should ask ATC to say again. Methinks they were just too lazy. I don't see any other excuse for landing with that sort of tailwind. Question for the airline guys. Does Boeing specify a max tailwind, or is it always dependant on other factors? 744 max tailwind component is 15kts if I remember correctly, it is specified in the fcom, subject obviously company imposed restrictions. And that is always the first question I ask when I hear about an incident or crash. I am not saying that was the case here, but duty hours are being pushed more and more all over the world. It can only lead to more crashes.
" It wouldn't be right for me to correct your statement. But, if I agree with you, there is a chance that we would both be wrong ! " For sure, and it was one of the youngest B747-400s around ... only 13 years young! I would love to see the operation to move/remove that airplane from there. Must be a bit of a logistical nightmare. Geez, what a loss.......glad there are no injuries. I guess best will probably be just to cut it up on the spot and truck it away as scrap metal. Luckily it is not obstructing the runway. Very sad to see a magnificent bird in that sad state.